Here is a selection of vintage audio equipment which has my seal of approval. They have been lovingly refurbished and tested by myself and are all interesting and good quality pieces - I wouldn't bother otherwise! Shipping for most items from Auckland is $20 - $40 to NZ only. Fair price paid for worthy restoration projects and faulty items - consolidate your hoard! All amplifiers serviced and tested for perfect operation of all features. Superior integrated amplifier with full compliment of features including source direct, MM/MC phono stage, two sets of nice big speaker connectors and subsonic filter. Original Sanken output devices. Serviced in near mint condition. Very well preserved. Respected English design from 1995. 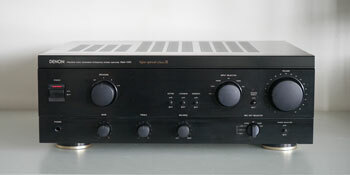 Has good phono stage and lots of power reserve. Serious pure stereo component with muscle and fine audio credentials. Moving coil capable phono preamp, tone defeat and two sets of beefy binding posts with speaker switching. Heavy, well made component with tone bypass, CD direct and two sets of nice big speaker connections. Serviced and working well in very good condition. Classic Japanese centrepiece incorporating an analogue tuner and full compliment of features and controls. Has inputs for turntable, tape and spares for other line level devices. Serviced in excellent condition. Well kept with very little use from new. Shines with good speakers where no bass boost or other modification of the sound is required. Serviced and cleaned in very good condition. Compact and simple component with some nice class A circuitry, toroidal power transformer, proper binding posts etc. Note - there is no phono preamp on this model. Separate power dual mono design. Serviced and working perfectly in near mint condition. Solid and capable modern era Japanese integrated component. Features a direct input to minimise signal path and 2 sets of beefy speaker binding posts. Good quality phono stage on separate internal circuit board. Pure analogue audio design, no video or digital processing. Front flap hides the minor controls for a sleek look. Working well in near new unused condition. Inside is pristine.